Hi! I’m Jory and I’m a mama on a mission. As the head chef in my home, I strive to create healthy, mostly vegetarian meals that are as unprocessed as possible. But, that’s the “easy” part! My mission is to keep my 3-year-old daughter from becoming a “picky eater.” So often I hear parents talk about how their kids used to eat “everything” and once they became toddlers they stopped eating all but around five foods. Over my dead body will that happen to my daughter! 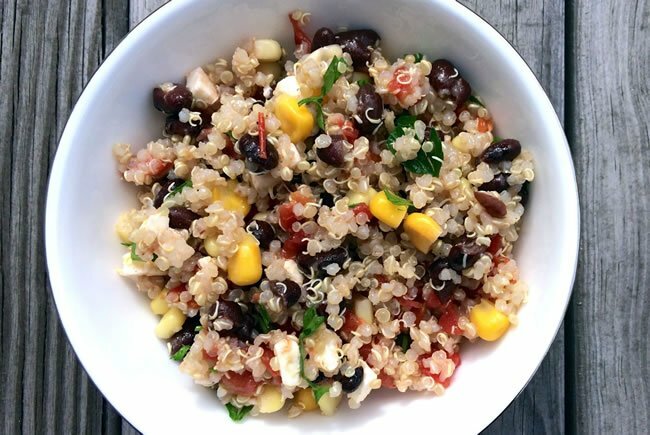 When my daughter was a baby, I cooked her all sorts of healthy, unprocessed baby food. Somewhere along this feeding adventure it hit me: To avoid the picky eater trap, I had to do more than just feed my daughter different sorts of tasty and healthy foods. I had to involve her in food by cooking together, shopping for food together and more. So, over the last 3 years, I’ve been using my background in early childhood education to create lessons around “food concepts”. My most valuable (and fun) tip is: cook with your kids. A few notes about cooking with toddlers and kids: Recipes will typically take longer than expected since you’ll be guiding your little foodie along the way. Plan to spend at least a few minutes checking over your child’s work and (likely) finishing some of it. Also, don’t be surprised if some ingredients get tasted along the way. It’s all part of the fun! Below I’m sharing five unprocessed recipes we love to cook together along with ideas to get your little one in on the cooking action. Happy eating! 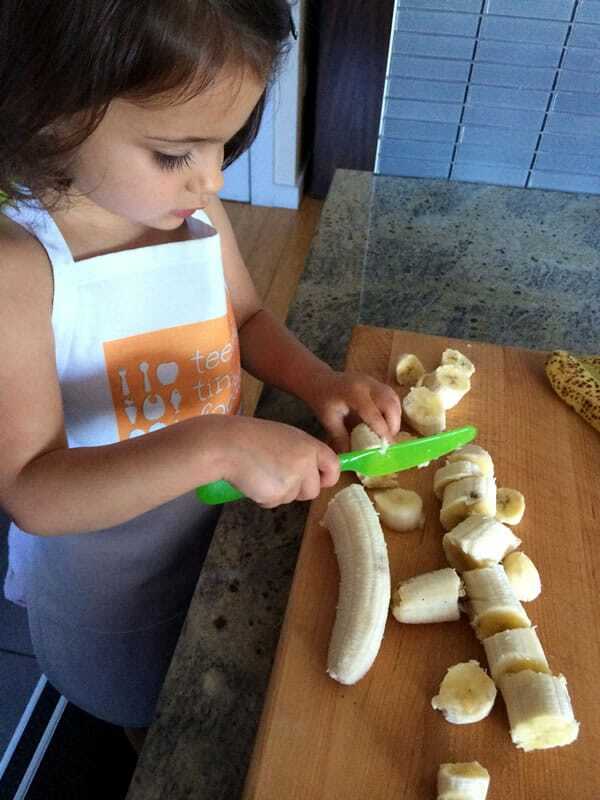 Alone, kids can wash the greens, chop unfrozen bananas with a butter knife, fill the blender and push the buttons. With assistance they can measure out the ingredients. Place all ingredients into a blender, adding the almond butter last. Pulse until smooth. Alone, kids can push the buttons on a traditional blender. With assistance, they can measure out the ingredients, help add ingredients to the pot and stir the soup in the pot. In a large saucepan, heat the oil over medium heat. Add the onions and a pinch of salt and stir. Sauté for 5 minutes, stirring occasionally. Add the zucchini and squash and another two pinches of salt. Sauté for 3 minutes and add the vegetable stock. Stir and raise the heat. Simmer the soup for 20 minutes. Add the spices and purée the mixture using either an immersion blender or a regular blender. Taste and adjust spices as desired. 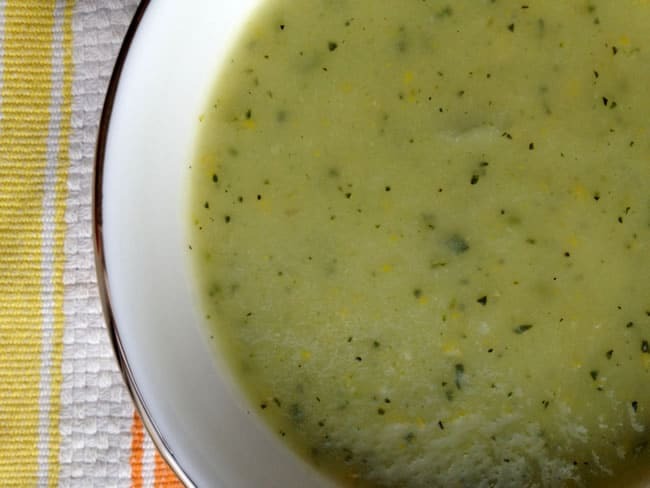 To chill the soup, pour it into a large shallow dish or divide it into individual portions of around 1¾ cup each. Place soup in the refrigerator, uncovered, for 1-2 hours. Alone, kids can juice the lime, and chop the mozzarella, add ingredients to the bowl and stir everything together. With assistance, they can measure out the ingredients. 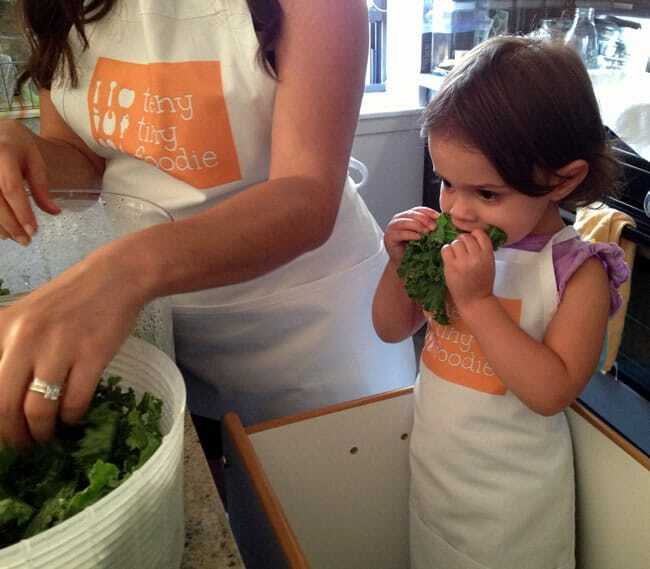 Alone, kids can wash the kale, tear it into small pieces and mix the ingredients together in a bowl. With assistance, they can measure the ingredients and spread kale out onto the baking sheet. In a large bowl, toss the kale with the olive oil and spices. Mix thoroughly so everything is well coated. Line a baking sheet with parchment paper and spread out the kale into one even layer. Make sure there is space in between the kale leaves so the air can circulate and they can get crispy. Bake for 15 minutes. Then, toss the leaves around the pan and cook for an additional 5-10 minutes until the chips are crispy. Alone, kids can mix the ingredients together in a bowl, scoop the filling into the apple, cover the apple and place it in a baking dish. With assistance, they can measure ingredients. Heat the oven to 325°F and either grease a baking dish or line it with parchment paper. 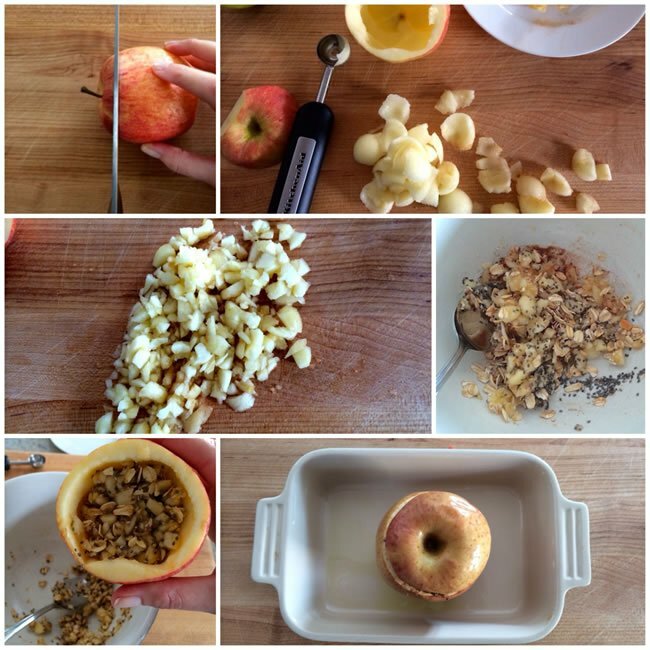 Slice off the top 1/2 inch of the apple, leaving a ring intact. Set top aside. Scoop out and discard the core. Scoop out the rest of the flesh, leaving a border around 1/2 inch thick of apple. A small melon baller or a rounded ½ teaspoon-sized measuring spoon works well. Finely chop the apple pieces and add them to a bowl. Fill the empty apple with the mixture. Fill to the top and pack it down. Cover with the apple top and place in baking dish. Be careful when removing the lid of the baked apple because steam will escape. Jory Lieber is a food-focused mom and at-home chef who has been raising her daughter to eat a variety of healthy foods right from the start. She uses a diverse range of natural ingredients to create a teeny tiny foodie as well as a foodie family. On her award-winning website, teeny tiny foodie, you’ll find the recipes she has been creating for her daughter and family, the food concepts she teaches her daughter, the tips and tricks she’s learned in the kitchen, and lots of funny stories she’s experienced along the way. You can also find Jory on Facebook, Pinterest, and Instagram. This post is spot on! I’ve been cooking with my almost-six-year-old since she was two. The best thing I ever did was get her one of those green plastic lettuce knives (seriously you can chop almost any vegetable with it) and a rolling pin that’s just her size. She’s now our chief salad maker and her biscuits are better than mine. She loves to invent recipes and throws together all kinds of interesting combinations of ingredients (much to my picky-eater husband’s dismay sometimes!). We love the Mollie Katzen cookbooks for kids. What inspiration for me, Karen! I look forward to the days when my little lady can out-cook me. 😉 Thanks for sharing your cooking successes with your daughter. My daughter (3) is obsessed with cutting food right now so I’ve been trying give her items she can successfully cut. She was so excited to be able to cut an apple the other day. I’ll have to get her a little rolling pin, too. And read FRENCH KIDS EAT EVERYTHING by Karen Le Billon! Love that book. I’m reading her new book “Getting to Yum” now. Ooh! I’ll put that on the list, too! Thanks, Lisa! As someone who is proud to say that I have raised two food-loving kids, I am so happy to see this post. Yes, cook with your kids, eat all kinds of food with your kids, and if they do go through stages of liking or disliking certain foods, don’t fret. My teenagers can hold their own in the kitchen and will eat almost any type of cuisine we cook or have a chance to sample on vacations. Great post Jory – so helpful to teach how to get kids involved. Sometimes that can be a little scary and hard to figure out when it’s all you can do to just get food on the table. My picky eater was bred out of allergies – completely our fault I believe, but we were just intimidated by them at first and just kept feeding him the same things that we knew he could (and would) eat. I do cook with my 3 year old too and he loves it, but he will rarely eat the food that we make together unless it’s a cake, muffin, or cookie! I look forward to reading through more of your blog and hopefully finding some great ideas to get him more interested! !